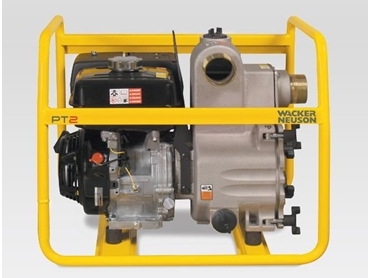 The PT series of centrifugal trash pumps from Wacker Neuson are reliable dewatering tools that can be used for a variety of applications. The pumps can handle up to 210 gpm (795 l/m) and solids up to one inch and are ideal when it comes to dewatering flooded basements, manholes, swimming pools, lakes and anywhere where there is unwanted water. With a radial flow design which produces high volume and head for superior jump performance, the trash pumps are also compact and provide quality components such as carbon ceramic mechanical seals for an extra long life. Available with gasoline or diesel engine, the trash pumps are easy to operate and have redefined the quality and durability standard of self priming pumps.